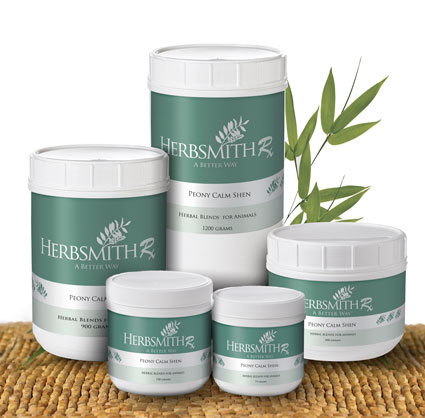 Herbsmith Rx Peony Calm Shen is a combination of herbs to calm heart and resolve liver qi stasis. Great for the fear aggressive dog. Anxiety is the negative emotion of disturbed heart shen and aggression and irritability are the negative emotion of a liver imbalance. It is not unusual in veterinary practice to see combinations of fear and anxiety with irritability and aggression. Liver Qi stagnation is brought on by stress and chronic frustration as well as toxins. So liver Qi stagnation is commonly experienced in todays animals. In the five element theory liver affects heart or wood affects fire. So as the liver Qi Stagnation exists in the patient it can also affect the heart shen. Resulting in the combination of negative emotions of irritability and aggression with anxiety and fear.